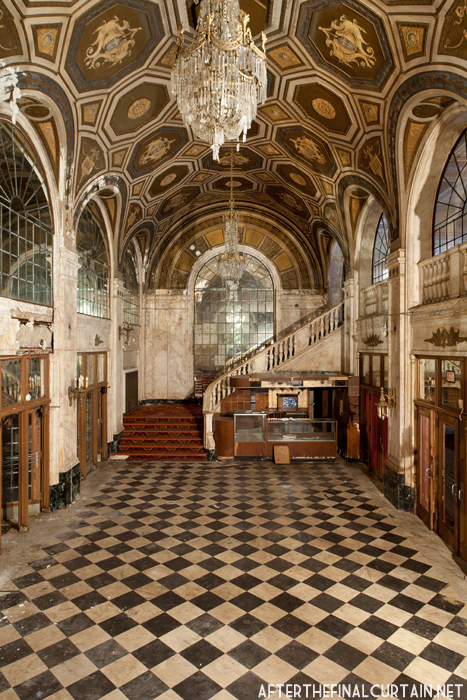 The lobby of the Loew’s Palace Theatre. After years as a predominantly vaudeville and silent film theater, the Palace began showing major motion pictures after it was sold to the Loew’s theater chain in 1934. The sale brought the theater’s first name change, from Poli’s Palace to Loew’s Poli. The name change didn’t affect the theater’s popularity — in August of 1939 the Loew’s Poli and Majestic Theatres celebrated their combined ten millionth patron. 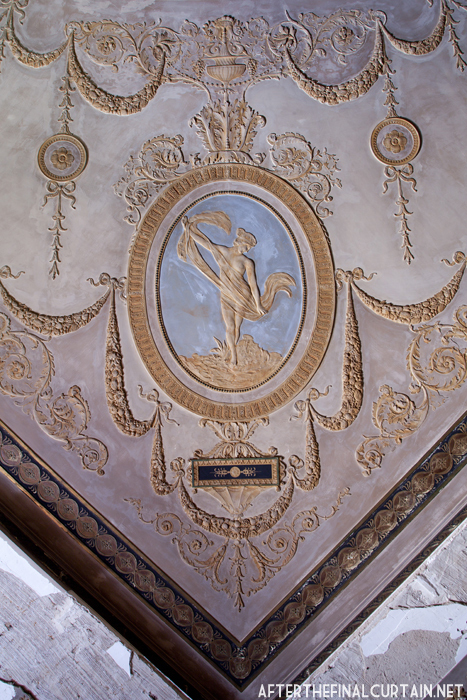 One of the frescos that was painted on the wall of the auditorium. Almost thirty years later the theater was renamed again as the Loew’s Palace Theatre. Due to a decline in ticket sales the Loew’s Corporation sold the building to David Zimmer, a lawyer from Bridgeport, in 1964. 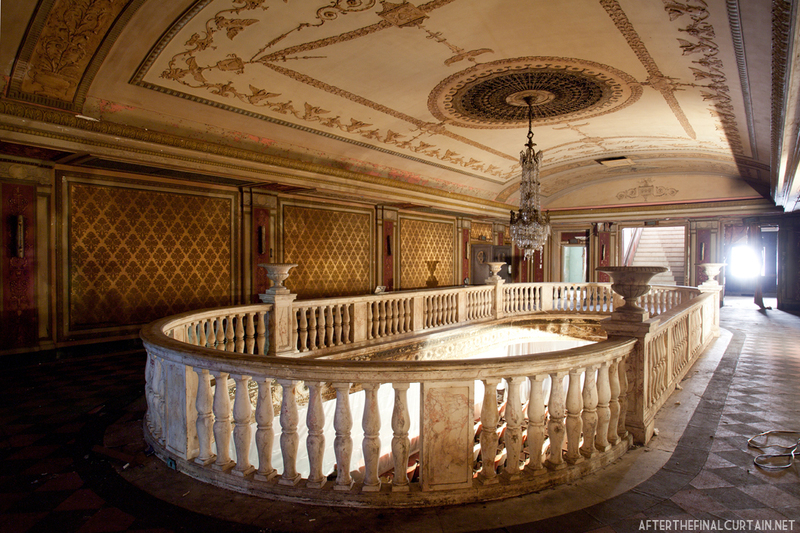 After showing adult films for a few years, the Palace closed permanently in 1975. Joy Center Ministries, Inc., who had the rights to sell or lease portions of the building at the time, intended to rent out the store fronts and turn the theater into a Christian revival center, but the project was put on hold when it was discovered that the city of Bridgeport had a $1.2 million lien on the property due to unpaid taxes. The city took possession of the building in lieu of payment. Since its closing, the interior of the Palace has been used as a set in movies, including the recent “All Good Things,” a 2010 film starring Ryan Gosling and Kirsten Dunst. 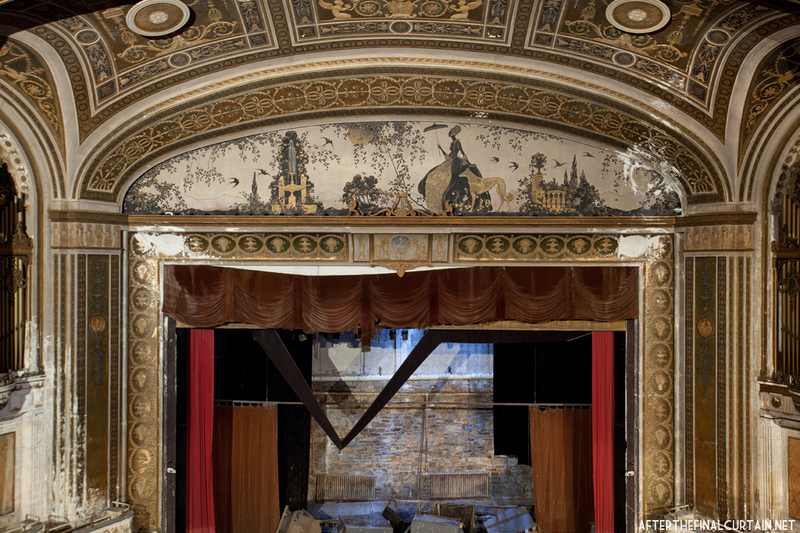 The Palace Theatre is now listed on the National Register of Historic Places; the city of Bridgeport hopes to one day restore the theater to its former glory. The chandelier still hangs in the Palace Theatre. A view of the stage from the main level of the auditorium. 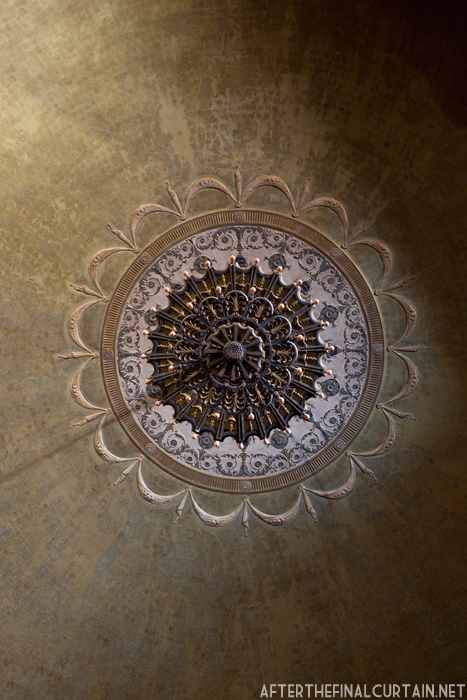 Ornate molding covers the theater’s ceiling. Another fresco is painted on the proscenium arch. The upper level of the lobby area that leads to the balcony. Another view from the balcony level of the theater. I would love to watch a movie in here. Beautiful photos. I see fascade Pipes along the sides of the auditorium. Is there any chance that the rest of the pipe organ is still in place, and even more unlikely, that it is still operable? There was a Hall theater organ installed in the Palace in late 1921 prior to the opening. I don’t know if the console is still there, but even if it is I doubt it’s been played in almost 50 years. I would doubt it’s still operable. I just happened to see your questions and comment – sorry for my being so late but – yes the console is still there but in very bad shape. I was given a tour when Joy Center Ministries had control of the property. You might be able to save the case although doubtful. The most important thing is the rest of the organ is for the most part is intact i.e. pipes, wind chest, swell box, etc. But again I’m sure not in working order however, a good organ service company and quite a bit of money could bring this instrument to working order. I’m sure a new blower would be in order, too since there is newer technology available since the instrument was installed. You would need this project to be undertaken by someone who really appreciates such a grand instrument and not inclined to destroy it like the fate of so many church pipe organs in Bridgeport. It is also impotant to note that shortly after the city of Bridgeport took control once again, they shored up the building by installing roofing material to prevent leaking so the deterioration due to outside elements was taken care of. Plus I was told some kind of climate control was installed as well. I hope this answers your question. To answer your question about the pipe organ console, our church currently has a Hall Pipe organ in playable condition that was installed in the 1920’s two manual 9-rank in Bridgeport. In the late 1990’s I found out about the organ in the Palace because we were considering re-voicing our current instrument and wanted to check out a larger Hall organ. I did see the three manual console in the orchestra pit. I was not able to get up close due to poor lighting and scaffolding. I was able to gain access to the building when contractors were shoring it up to protect against the elements. Sad to see this wonderful relic from the golden age of movie theaters. This theatre seems to be in very good condition for having been closed as long as it has. It would be wonderful to see it restored. What a beautiful space. It’s so sad to see it sitting there not being used. On the other hand, Thank you for documenting these spaces. I spent my early childhood going to the Palace and the Majestic, saw many Elvis movies, Our Man Flint, Whatever Happend to Baby Jane, etc. 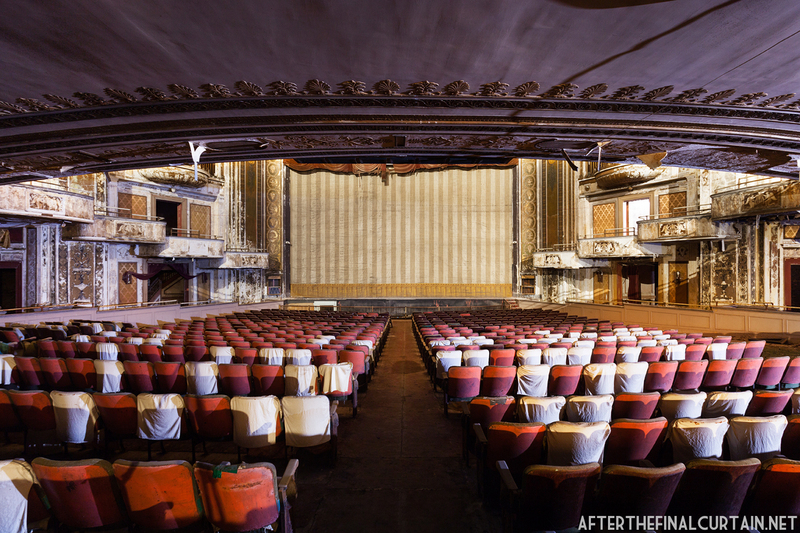 I’ve always loved those theaters. To Matt, John and Derrik. I am involved with Pipe organ restoration. I believe Hall organs were well made. I even have a few ranks of Hall pipes that are collecting dust in my attic. If the windchest and pipework are intact they would be worth removing and reconditioning. The design of wind chests and pipes has not changed since the early 1900’s. I doubt if the old console is useful, because the old technology with pneumatic switches has been replaced with digital switching. Unfortunately I am too far removed from the location, and already have more than I can restore in several lifetimes. I would like to encourage anyone to give the windchests and pipes their consideration and if appropriate, their TLC.. Probably the theater has remarkable acoustics. Is it true? My mother used to be a candy girl here and I used to play in the curtains while the movie played. This was one of my favorite memories as a child and I’ve grown to love old theatres. I would love to see this beautiful, historic building come back to life and bring joy to others as it did so many. There is Air Conditioning, And also HEAT, this is “under” the main lobby. A maintenance man was needed to operate this equipment. He got very sick, and we visited him in St.V’s, myself and the candy girls ! Just wanted to compliment this site. I’m both elated and saddened to find it – and you’re absolutely right – people paid to see the theatre, not the movie. But excellent work. I really appreciate what it is you’re doing. 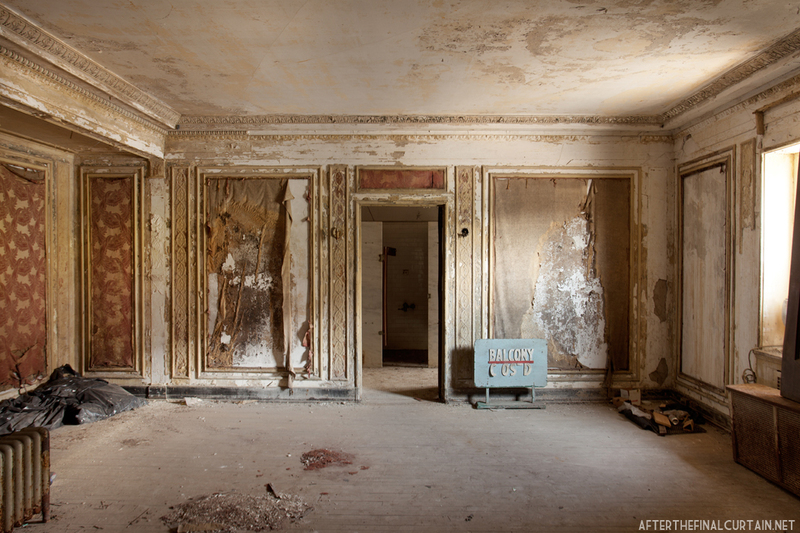 On a side note (and you’re welcome to send me a message privately if you need to answer that way), but how do you gain access to the interiors of many of the buildings which are in significant disrepair? This is how they sparked people’s imaginations before special effects. How could you not have a great experience in a building like this?! As our built environment becomes more and more focused on cost and marketing-of-the-moment, buildings like this one help remind people of what is possible and how people lived in earlier times. Hello….my mom remembers this theater….she’s 77 now. Is it being renovated or has renovations come to a halt. So sad if it has. There’s many useful classic buildings towns just let go….and they shouldn’t…..this is our history. I remember going to the Palace both in the 60’s to see a double Walt Disney Features and in 1974 to see an Adult film called “Pennywise” I paid $2.25 to see this 25 minute film followed by an out of date Travelog film short. The Theater smelled bad inside and they did not advertise these Adult movies. You either knew about it or you didn’t. Also there would be Blue lights under the marquee letting people know the Palace was open. My two aunts who worked at General Electric on Boston Avenue would take my older brother and me to both the Loew’s Poli and Majestic beginning in the early ’40’s. I was about three years old, and the first movie I remember seeing there was NOTORIOUS, and I remember that scene where Ingrid Bergman is drugged out and in bed and sees Cary Grant upside down! And then, of course, we would see the MGM movies at the Loew’s Poli and the 20th Century Fox films at the Majestic. I currently go here at LIU Brooklyn and, these photos are refreshing and very interesting. Thank you for keeping the history alive. 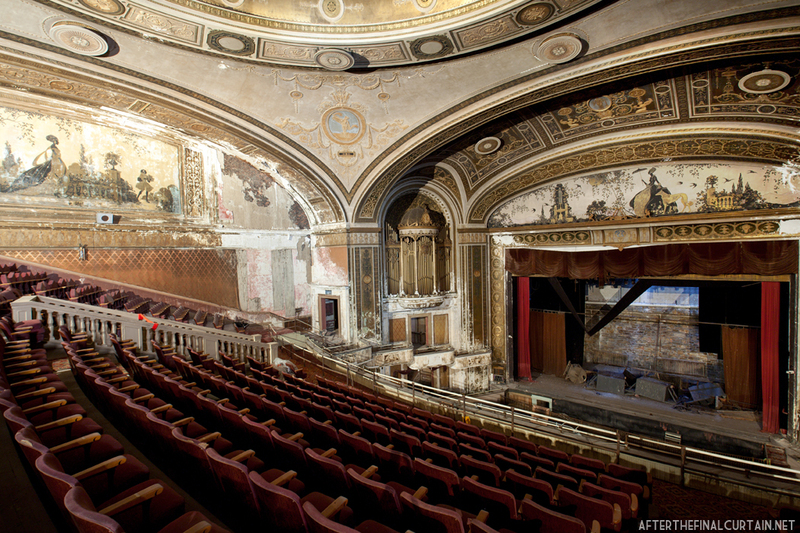 Ronald Scinto & artist David Mel have recently spearheaded CHAMPIONS FOR THE PALACE & MAJESTIC THEATERS, which is in the process of filing for non-profit status in Connecticut, under the umbrella of CHAMPIONS OF BRIDGEPORT’S HISTORIC PRESERVATION. We are dedicating our time, money, blood & sweat to save these gems located in Downtown one block away from buildings that are undergoing multi-million dollar renovations. We have recenly met with city officials, who are on board & will be personally taking it on our shoulders to remove graffiti & jersey barriers, install safety netting & eventually secure the exterior facade in Spring 2015. 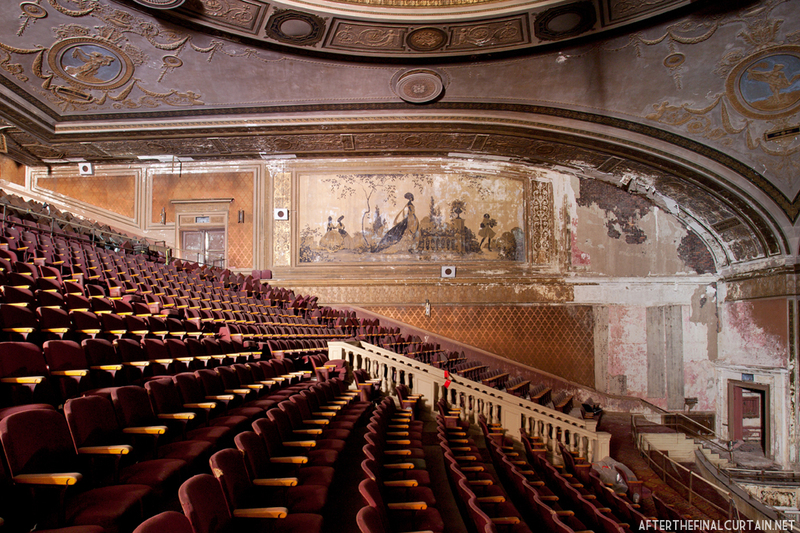 These two theaters in Bridgeport Ct are a ‘National Treasure’. No where else in the U.S. is there a building like this with TWO giant movies palaces so well preserved, the Palace, is larger than the Loews Kings in Brooklyn which is being remodeled and reopened, it is also in much better condition than the Kings was. The Kings has not even opened yet and top end business are already moving into the decaying area of Brooklyn. Bridgeport has this ‘Jewel’ that can finally be the catalyst that can bring the city back to life. So close to 1-95 and I-84, only two blocks from Metro North, and only blocks from the ferry to Long Island. 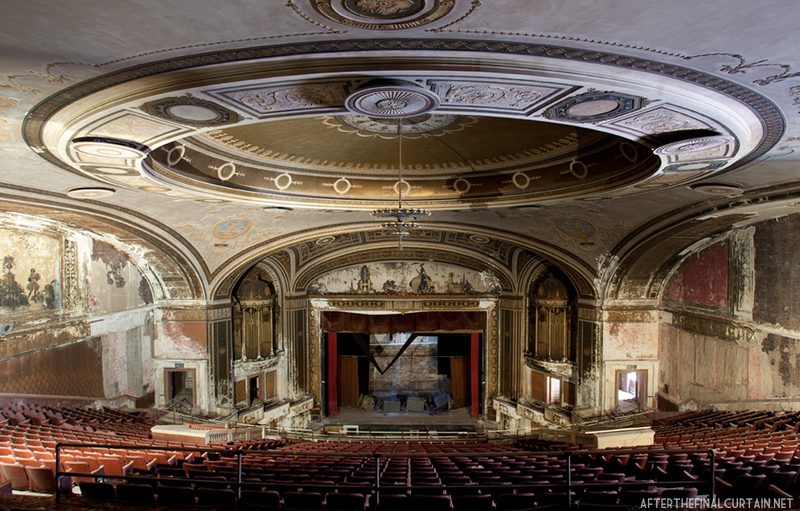 The Majestic should be remodeled for classic film showings, the Palace could house live shows, concerts, and film Openings with its huge 3650 seats! The key to Bridgeport’s re-birth is sitting right there on Main Street! Those old pipe organs are environmental hazards due to the lead used in the pipes. Hazardous waste teams often end up having to dispose of those outdated organs. Not to mention that those old organs can be fire hazards from faulty mechanical circuits to shorting and overheating blowers. I grew up in BRIDGEPORT and attended the POLI MAJESTIC THEATERS back in the day.Great movie houses.A shame they fell to the wayside over the years.I hope to see them restored and blossom again as the mecca entertainment center it once was. 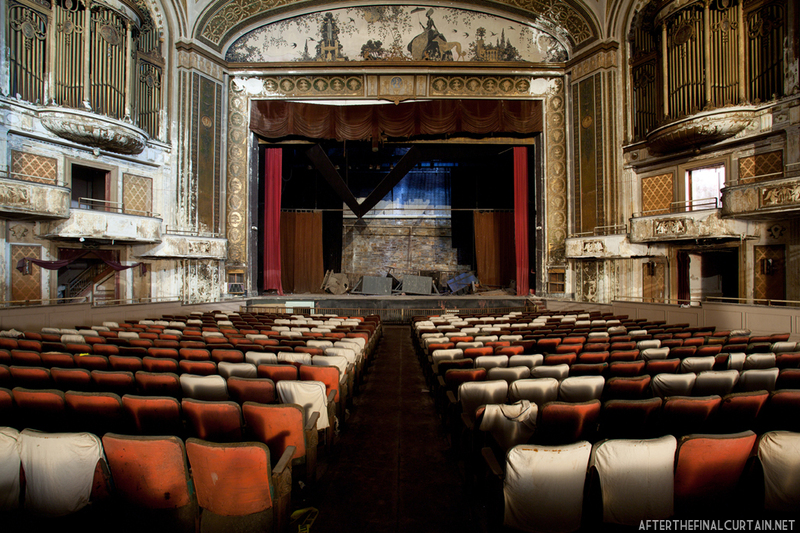 What happened to the funding to renovate the LOEWS POLI AND MAJESTIC THEATERS? Thank goodness it someone had the foresight to put it on the Historic Register! Happy to hear this, and as always, happy to see your photos! Does this theatre have a fly system? to play. I even attended a Victory Bonds program at the Poli hosted by Uncle Don of radio fame. We also had a theater in our neighborhood, now long gone, the West End, where on a Saturday there would be previews, news, a cartoon, a cofeature, and usually a Western..all for 25 cents. Thanks for sharing Roger! Do you recall the name of the theater in your neighborhood? Ye, It was called the West End on State Street. It was owned at that time by a Mr. Schwartz. His son, Marty, was in my high school, Bassick. There was a candy shop next door(actually the same building) run by Grandpa Schwartz. If I remember correctly they would have at least three different programs..ie. Saturday, Sunday – Tuesday and Wednesday – Friday. Interesting. Was there another theater across the street that you can recall? There’s a building that looks like a theater, but is currently occupied by a church. Yes, It was called the Liberty. On the other side of the street a block down. It was very small, not well kept, and played mostly Westerns. I almost forgot the serials that played every Saturday at the West End that brought us back week after week.